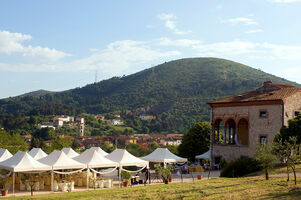 Perched above a small village in the green Lucca Hills, with panoramic views of the Monti Pisani, this lovingly restored country retreat makes for an excellent venue for those wishing to have their accommodation and reception site at the same location. 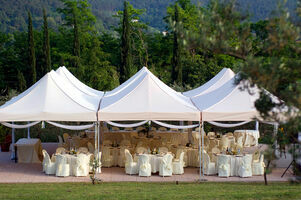 Best of all, unlike many villas in the area, Da Emilio's does not require a week long stay. A three night minimum stay is all that is needed to reserve a long wedding weekend, so very convenient for large parties whose guests may not be able to commit to a longer stay. 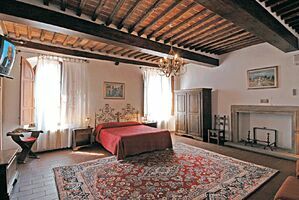 The estate is composed of a main villa that dates back to the 15th century and has 17 large, airy rooms, some of which can be made into quadruples or triples for those with families. 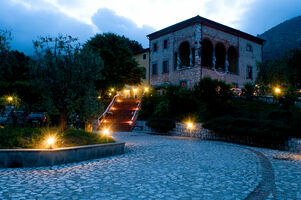 Inside the main villa there is both a bar and a restaurant that serve local Lucca specialties. 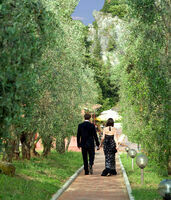 30 meters from the main villa, down an olive tree lined path, lies the newer annex accommodations. Although more recent, annex rooms still boast exposed wood beam ceilings and cotto floors. Each room has its own attached patio with umbrella, table, and chairs. Four of the rooms are adjoining for families. There are a total of 14 double rooms in the annex, many of which can accommodate an extra single bed. 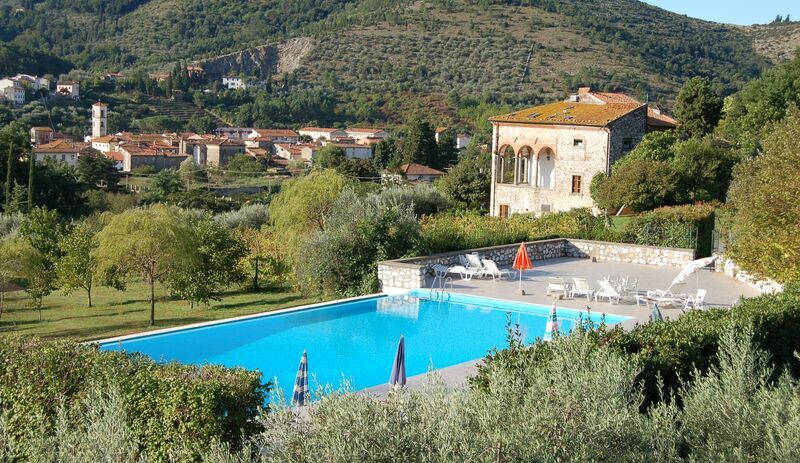 The bed and breakfast also has a tennis court and, cradled amongst the grape vines and olive trees, an immense panoramic pool that gets the sun the entire day. Just below the estate sits a quiet village, less than a 5 minute walk away. There, you'll find three restaurants, a butcher shop, 2 green grocers, a cafe/bar, and hair dresser. 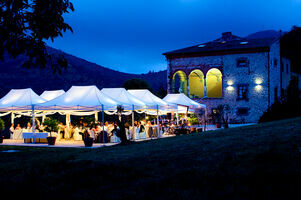 To start your reception, you can sip cocktails while admiring the sunset in the 14th century loggia of the main villa. 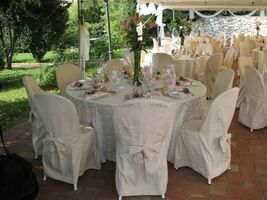 Then retreat to the white gazebo tent, just in front of the main villa, to enjoy a beautiful 4 course Tuscan feast, all made with fresh local products. After midnight the main villa's restaurant gets converted into a disco, for those who wish to continue dancing and celebrating into the wee hours. Another plus is that there is no need to bring in a caterer to this venue as there is already a fully equipped kitchen and staff to do the meal service. For those of you considering a Catholic Wedding, Da Emilio's merits consideration due to its proximity to a beautifully restored 12th Century Romanesque church.